This was my first Bluegrass banjo. My wife bought it for me for Christmas in 1993. 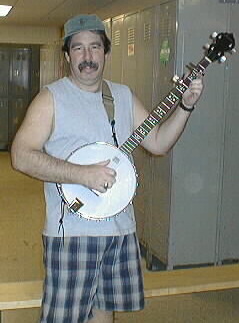 This is the banjo that stays in my locker at work and that I play during breaks and lunch. I converted it to an open-back by removing the resonator and the arm rest. It has a surprisingly nice sound for a cheap banjo made in Taiwan. It has probably the fanciest inlay of all of my banjo's and a real ugly peghead. The peghead is very large and it has those geared guitar type tuners. I replaced the 5th string tuner with a Grover, because the other one was junk. The bridge is made out of some unidentifiable wood, but does the job. It has a Remo head with many yogurt stains and other assorted goodies, as I try to eat and pick due to some time constraints. Yes, once again this is the back of that same banjo. There is just no fooling you.... Who says banjer players is dumb??? This canoe paddle looks very new, but I have gotten a lot of use out of it. It definitely does the job. This is my BEST side....!! Banjo madness caused me to jump up on this bench and begin frailin' like mad. Yahoooo....!! !